For the fourth year running, the NASC is able to report a fatality-free year, with the incidence rate almost half what it was five years ago – despite a 14% rise in the number of NASC member operatives over the period. The report reveals the lowest incidence and frequency rates recorded by NASC full contracting member companies and also showed a 16% decrease in the frequency of manual handling injuries. Additionally, no members of the public were injured around NASC member scaffolds. NASC President, Alan Lilley said: “Once again, the NASC Annual Safety Report has highlighted how successful our members are at reducing accidents through compliance with industry safety standards and adherence to NASC guidance. No doubt, the release of SG4:15 Preventing Falls in Scaffolding Operations was a major factor in achieving this reduction in accidents. “And the fact that there’s been a marked reduction in the number of accidents – despite a record-level of NASC membership and a 14% increase in operatives – shows what we do for our members in producing quality safety and technical guidance. The NASC 2017 Safety Report will be officially launched at the ‘Health & Safety Scotland’ Event industry trade show held at Glasgow SEC, May 3-4. The report is also being circulated with Construction News Work at Height issue on June 9th and Construction National Spring issues, with a digital reader/PDF version available on Issuu and via the NASC website. Printed copies of the report will be sent to all NASC full and information members, as well as construction and health and safety industry professionals. And further copies can be posted out to interested parties by contacting NASC directly, via email: enquiries@nasc.org.uk. 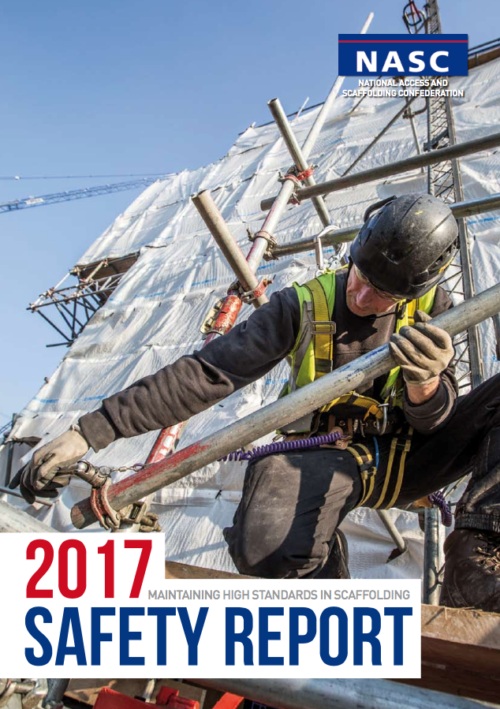 For further details on the NASC 2017 Safety Report, information on recently reduced prices for TG20:13 publications, to order copies of SG4:15, for information on the latest Technical Guidance (TG) and Safety Guidance (SG) notes and on the NASC – the UK scaffolding industry trade body – including how to join, please visit the website.